As we get deeper into fall, our thoughts turn to a changing menu here at Omni. Embracing the warmth of fall goodies can make a menu special and memorable. One of our favorites is our delicious curried butternut squash soup, a sure-fire way to warm up any dinner. Over the last weekend, we catered a beautiful wedding up in Gainey Vineyard and started out the 3-course menu with our famous butternut squash soup served in a mini pumpkin with creme fraiche garnish. 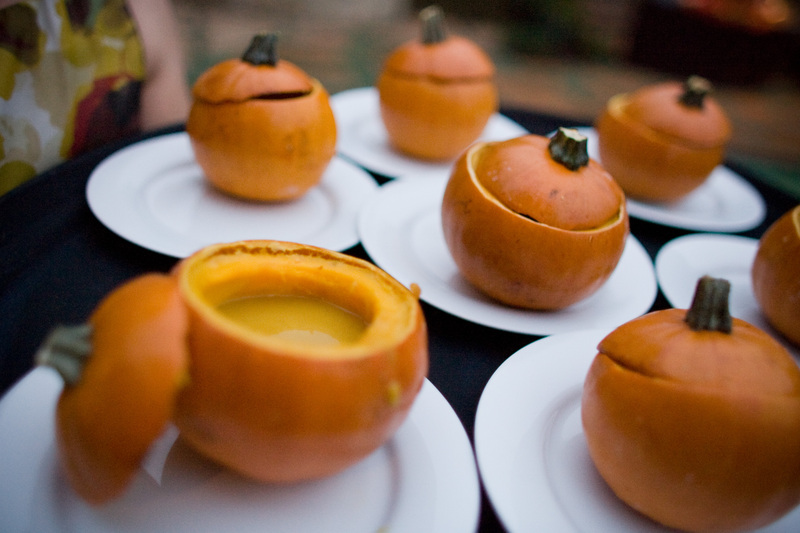 Our servers loved delivering the mini pumpkins covered to the tables and lifting the lids to reveal the warm soup to guests’ oohs and ahhs. The key is to lightly roast the mini pumpkins before filling with soup and to keep the lids on to enure the soup is served steaming hot. Impress your guests at your Thanksgiving gathering by serving these festive Autumn pumpkin soup bowls as a starter!